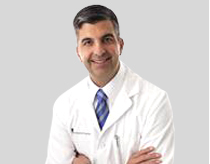 Dr. Chaudhary is board certified and fellowship trained in adult joint reconstruction from the Anderson Orthopaedic Research Institute in Alexandria, Virginia. Dr. Chaudhary returns to Cincinnati where he completed medical school at the University of Cincinnati in 2000. Joining Beacon Orthopaedics as a total joint specialist, Dr. Chaudhary provides expertise in unicondylar knee replacement, and total joint revisions of the hip and knee. Dr. Chaudhary will see patients at Beacon East, in addition to the existing Beacon locations at Summit Woods and Harrison Avenue. Haleem is married to physician, Dr. Rekha Chaudhary, with two sons Jay and Sammy and one daughter Alisha. Primary hip and knee replacement, revision hip and knee replacement, unicondylar knee replacement, minimally invasive techniques, general orthopaedics, orthopaedic trauma. “Intrapelvic cementless component extraction with immediate triflange acetabular reconstruction using the retroperitoneal approach.” Foster S, Chaudhary H, Assenmacher B. J Arthroplasty 2009 Feb; 24(2):323.e1-5 Epub 2008 June 13. “Total hip arthroplasty in renal transplant patients.” Nowicki P, Chaudhary H. J Bone Joint Surg Br. 2007 Dec;89(12):1561-6. Review. “Mechanical Axis Variation when Component Valgus Angles are Reproduced across Different Total Knee Designs.” Presented American Academy of Orthopaedic Surgery Annual Meeting 2006. “Intradiscal Electrothermal Therapy: A Treatment Option in Patients with Internal Disc Disruption.” Biyani, Ashok MD, Andersson, Gunnar B.J. MD, Chaudhary, Haleem MD, An, Howard S. MD. Spine, 28 (15S) supplement S8-S14, August 1, 2003. “Biomechanical Aspects of Liss Plating and Case Reports.” H Chaudhary MD, N Ebraheim MD. Presented, Medical College of Ohio, 2003. “The Accordian Technique Exchange Intramedullary Nailing: A New Technique.” Haleem Chaudhary MD, Nabil Ebraheim MD. Presented, Medical College of Ohio, 2002. “Cost Effective Diagnosis of Ventilator Acquired Pneumonia.” Haleem Chaudhary MD, Fred Luchette MD. Published, University of Cincinnati Cost Effective Medicine, 2000. “Percutaneous Pinning vs. ORIF of Proximal Phalanx Fractures.” Ken Jones MD, Haleem Chaudhary MD, Peter Stern MD. Presented University of Cincinnati Department of Orthopaedics, 2000. “Stimulation of the Na +/K +ATPase and Glycolosis by Elevated Intracellular Na+ in Sepsis.” Haleem Chaudhary MD, Howard James PhD, Josef Fischer MD. Presented, University of Cincinnati honors research symposium, 1998. “Isolation and Characterization of Spermatolgonial Stem Cells in the Pig Model.” Chaudhary H, Dym M. Biology thesis. Presented Georgetown University, 1996.